Educator and practitioner in biomimicry, Denise DeLuca, has created a new book mapping the steps we can take to re-align ourselves with nature in our everyday lives, and showing how that may help solve the world’s problems. And, in her book, each step is illustrated with a delightful drawing. To learn more about Denise and her book, come to her upcoming talk at Eagle Harbor Books on Sunday April 23rd at 3pm. 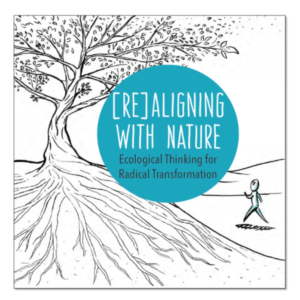 In this podcast, DeLuca speaks to BCB host Sonia Scaer about her book: “Re-Aligning with Nature: Ecological Thinking for Radical Transformation“. We’ve heard about the “green” architect or designer who attempts to safeguard air, water, and earth by choosing eco-friendly materials and construction practices. But in the field of biomimicry, designers, engineers and makers create solutions to human challenges by looking at nature’s ways and adopting nature-inspired designs. 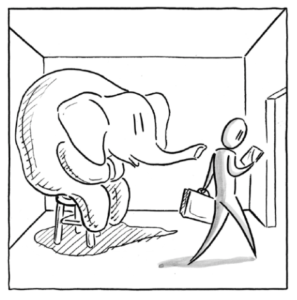 Sample illustration by Stefanie Koehler from “Re-Aligning with Nature”. Click image to see sample 2-page spread of drawing and text from book. Denise briefly describes her career journey — working initially as a civil engineer — and tells us what led her to become an educator and practitioner in biomimicry. After many years teaching biomimicry, she observed that people, while learning the practice, started thinking and feeling more creative and curious and as a result came up with innovative and sustainable solutions. Denise is Director and co-founder of BCI: Biomimicry for Creative Innovation, a network of innovators and design professionals seeking to radically transform businesses and organizations to be in harmony with nature. 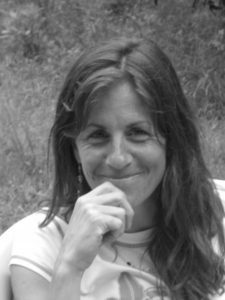 Denise also teaches an online course in Biomimetic Design and Creative Leadership for the Masters in Sustainable Design program at Minneapolis College of Art and Design (MCAD). “Re-Aligning with Nature” is a richly-illustrated book, with every page accompanied by a light-hearted line drawing by Stefanie Koehler, one of Denise’s MCAD students. In this podcast, Denise describes how that book-design choice came about and why she chose the format to actively engage the reader in a transformative journey. Denise’s book can be obtained from Eagle Harbor Books. Credits: BCB host: Sonia Scaer; BCB audio editor and social media publisher: Barry Peters.